Fall semester is now in full swing! Before classes got too crazy, I3HSA met to share tips on how to get the most out of grad school. Discussion topics included time management, becoming scientifically literate, teamwork, professionalism, and communication. We also discussed upcoming events for the semester and elect our new officers for next year's I3HSA. Our next professional development event will be an Industry Discussion panel. We've invited a number of professionals from the area to come and share tips on interviewing and what to expect when you begin a new job in IH. 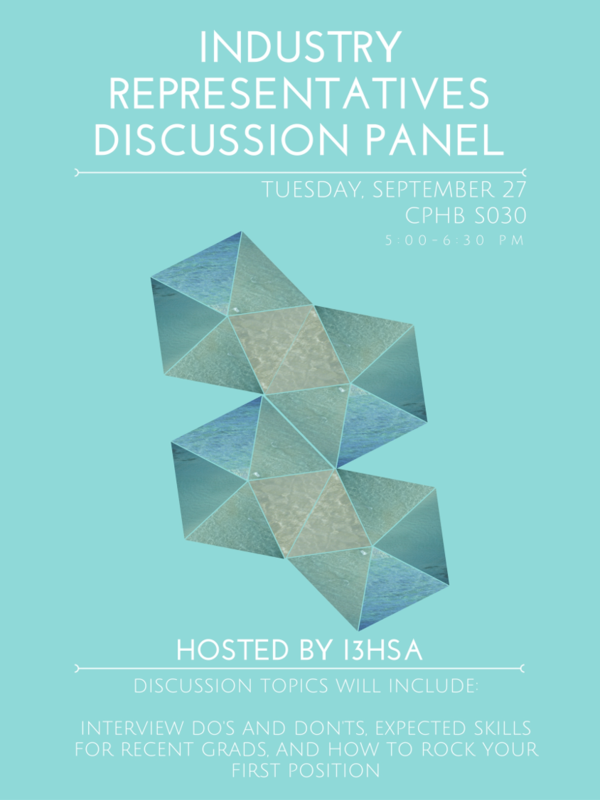 The panel will be held on Tuesday, September 27th in the College of Public Health, Room S030 at 5:00pm. Hope to see you there!